Al Qaeda's No. 2 leader warned in a new videotape released Thursday that the terrorist group would not stand idly by while Israeli bombardments "burn our brothers" in Lebanon and the Gaza Strip. In the message broadcast by Al-Jazeera television, Ayman al-Zawahri, second in command to Osama bin Laden, said that al Qaeda now saw "all the world as a battlefield open in front of us." The Egyptian-born physician said the Hezbollah and Palestinian battles against Israel would not be ended with "cease-fires or agreements." "Just as Hezbollah tried to hitch its wagon to the Palestinian cause, the al Qaeda message from Ayman al-Zawahri is an attempt to galvanize the radical Muslim world, an attempt to unify the message," said CBS News foreign affairs analyst Pamela Falk. The message "is no surprise, and it is more of a message to hobbled al Qaeda forces than to world leaders, but it is not likely to convince anyone that there is unity among the terrorist groups." Israel continued to pound suspected Hezbollah positions across Lebanon on Thursday, extending its air campaign a day after suffering its highest one-day casualty toll since its military offensive began. A Hezbollah rocket slammed into a detergent factory in the northern Israeli town of Kiryat Shemona on Thursday. There were huge flames and a pall of black smoke that sent six fire engines racing to the scene, reports CBS News correspondent Robert Berger, but there were no toxic fumes and no injuries. An Israeli Cabinet minister said lack of agreement by world leaders meeting in Rome on a cease-fire gave Israel permission to press deeper to wipe out the Islamic militant group, but Israel Radio reported top cabinet members decided not to expand the Lebanon offensive. The ministers did decide to call up more troops. "Israel is showing no signs of slowing down with its military assault on Hezbollah, but the fact that al Qaeda is now weighing in on the crisis here will only heighten fears that this situation could turn into a much broader war," reports CBS News chief foreign correspondent Lara Logan. Americans generally approve of President Bush's handling of the latest Mideast crisis, but 60 percent think world leaders don't respect Mr. Bush, a CBS News/N.Y. Times poll finds. Also, most are pessimistic about the prospects for Mideast peace. A diplomat who was in the room in rome told CBS News one cease-fire plan would be to disarm and flush out Hezbollah from southern Lebanon. A multinational force would come in and patrol the buffer zone as well as the ports, the airport, and the Syrian border, reports CBS News correspondent Thalia Assuras. In the first apparent ramification of the killing of four U.N. observers by an Israeli air strike earlier this week, Australia decided to withdraw 12 unarmed logistics specialists who had been sent to southern Lebanon to help with evacuation efforts. The fighting began last month following a Palestinian cross-border raid in which an Israeli soldier was captured, then expanded to Lebanon after Hezbollah militants captured two other soldiers in a raid earlier this month. "The war with Israel does not depend on cease-fires. ... It is a Jihad for God's sake and will last until (our) religion prevails," al-Zawahri said. "We will attack everywhere." 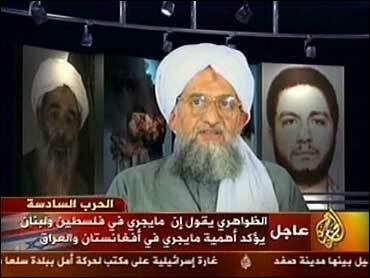 Al-Zawahri wore a gray robe and white turban. A picture of the burning World Trade Center was on the wall behind him along with pictures of two other militants. "It's a slicker look for al Qaeda's number two, who delivered his latest video message from what appears to be a professional television studio, complete with background props," reports Logan. The Arab satellite station appeared not to have transmitted the entire tape, using instead selected quotes interspersed with commentary from an anchor. Thursday's Israeli air strikes also hit a Lebanese army base and a radio relay station and destroyed several roads. The series of raids in northern, eastern and southern Lebanon killed at least one person and wounded others. CBS News correspondent Vicki Barker reports from Beirut on Lebanon's growing humanitarian crisis. Despite heavy losses Wednesday, Israeli ground forces were continuing their advance into the Hezbollah stronghold of Bint Jabail in south Lebanon, reports Berger. The army says troops are facing fierce resistance from about 100 Hezbollah fighters who are holed up in bunkers and tunnels, using classic guerrilla tactics and vowing to fight till the end. Despite the loss of nine soldiers yesterday, troops heading up to Lebanon are determined to continue. "I feel fine about it, I feel like I'm doing what I need to do, doing my duty," Tamir Goldberg, who immigrated to Israel from Dallas six years ago, told Berger (audio). One of four crew members, Goldberg says he feels relatively safe in his Merkava tank. So far, 16 days of bombardment and intense ground fighting in recent days have been unable to stop Hezbollah rocket attacks on northern Israel. On Wednesday, the guerrillas unleashed their biggest volley yet — 151 rockets into northern Israel. More than 4,000 rockets in all have been launched. With cease-fire efforts stalemated, Secretary of State Condoleezza Rice said Thursday that she was prepared to make a second tour of the Middle East to try to hammer out a resolution, but she did not specify when. Israeli Justice Minister Haim Ramon, who is close to Israeli Prime Minister Ehud Olmert, said the Israeli air force must bomb villages before ground forces enter, suggesting that this would help prevent Israeli casualties in the future. Thousands of civilians are believed to be trapped in villages across the border region in southern Lebanon, according to humanitarian officials who have toured the region. Americans who escaped a village near the epicenter of the ground fighting said Wednesday many U.S. citizens were still there. On Thursday, the Israeli military's radio in south Lebanon warned that the army "will totally destroy any village from which missiles are fired toward Israel." The statement, aired on Al-Mashriq radio, also told Lebanese not to use the road from Qleileh — which is near the Mediterranean coast — to Houlah in eastern Lebanon across the border from Israel's Kiryat Shmona. Israeli air strikes on Thursday pounded roads and suspected Hezbollah residences in the south and east, as well as a Lebanese army base in the north, while artillery and warplanes barraged the immediate border region where ground fighting continued.